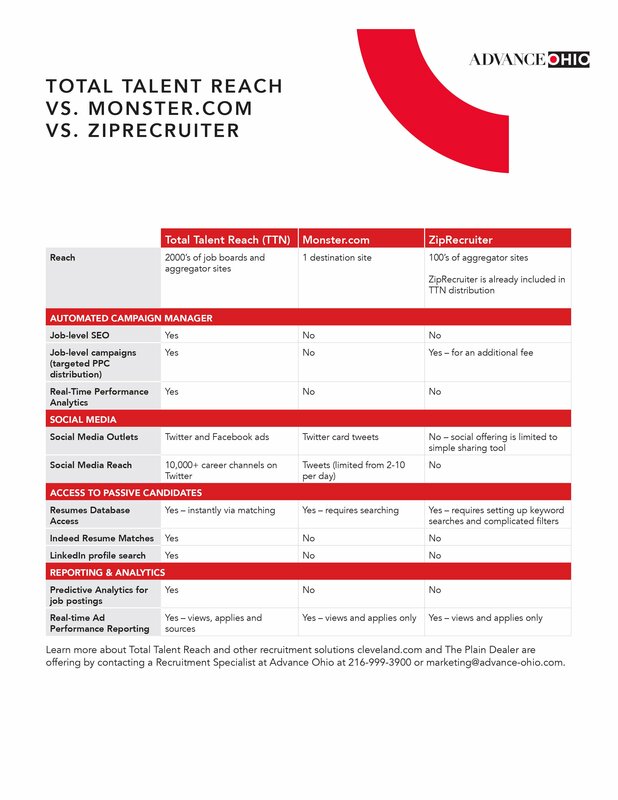 Which online recruitment platform is the right fit for you? Home » Which online recruitment platform is the right fit for you? Deciding which online recruitment platform is the right fit for your hiring needs can be tough. All are promising to deliver the perfect candidates right to your inbox. Monster.com was one of the first job boards on the market, but is the approach of a one destination job board still effective? ZipRecruiter aggressively markets their job posting distribution service through many advertising channels to entice employers to register and post their jobs instantly to 100+ job aggregator sites. But what services and results do you really get? We took a deeper look at these two recruitment platforms and compared them with our own recruitment tool Total Talent Reach (TTN). To download this overview please click here. Contact us today to learn more about Total Talent Reach and our recruitment solutions.